THOMAS, SOPHIA (Mason), translator and editor; b. 15 Nov. 1822 at Red River, youngest daughter of Dr Thomas Thomas*, HBC chief factor and governor of the Northern Department, and an Indian woman; d. 10 Oct. 1861 in London, England. When Dr Thomas died in 1828 he left each of his six daughters £1,000 in 3 per cent consolidated Bank of England annuities. Sophia had the benefit of a good upbringing, first in the home of the Reverend David Thomas Jones*, in whose trust she had been placed by her father, and, after Jones’ death, in the home of the Reverend William Cockran. She received a sound education at the Red River Academy under the direction of John Macallum. An indication of her scholastic ability was the offer made to her in 1843 to be a governess in the ladies’ section of the academy. She declined in order to marry at Red River a young Wesleyan Methodist missionary, the Reverend William Mason. 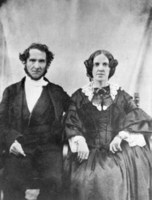 The newly married couple set off on 11 Aug. 1843 by York boat for the Rossville mission, north of Lake Winnipeg, which was to be the centre of their missionary endeavour for 11 years. At that time Rossville mission was in the charge of the Reverend James Evans*, inventor of the syllabic system of writing the Cree language. Evans issued some religious literature but his efforts were hampered by the lack of a proper printing press. In the summer of 1845 he left with his family because of ill health, and that autumn the long-desired hand press arrived from England. It thus fell to William Mason to propagate the Gospel among the Indians by means of the printed word. In 1854 Mason left the Methodist Church, joined the Church of England, and moved to York Factory. Four years later the Masons sailed to England to superintend the printing of the New Testament in Cree syllabics; when this was completed in 1859, they remained to see the Old Testament through the press. Shortly after her arrival in England in 1858 Sophia suffered a severe attack of pleurisy, and she continued to have pulmonary afflictions. Her translating was frequently interrupted by seizures of pain. In July 1861 she gave birth to her ninth child. She continued her work, and three months later was dead. The last of the Old Testament books, Malachi, had just come off the press. HBC Arch. A.36/13, will of Thomas Thomas, 30 Nov. 1827. CMS Arch. (London), Journal of the Reverend William Mason, 10 Sept. 1854–28 Aug. 1858 (copy at University of Alberta Library, Edmonton). Nathaniel Burwash, “The gift to a nation of written language,” RSC Trans., 3rd ser., V (1911), sect.ii, 3–21. [William Mason], “A short sketch of the life and missionary labours and happy death of Sophia Mason,” Church Missionary Gleaner (London), new ser., XI (1861), 135–40. Bruce Peel, “THOMAS, SOPHIA,” in Dictionary of Canadian Biography, vol. 9, University of Toronto/Université Laval, 2003–, accessed April 20, 2019, http://www.biographi.ca/en/bio/thomas_sophia_9E.html.